Although justly famed for his landmark defense of the divine inspiration and authority of Scripture, B.B. Warfield was a theologian with multiple interests. In Biblical Doctrines Warfield reveals his mastery of such doctrines as the Trinity, the Person and Work of Christ, Redemption, and Faith. He covers the ground from the first essay, on Predestination, to the final one, on the Millennium with the apparent ease of the master craftsman. Rigorous in his scholarship, Warfield also possessed a personal spirit and style reminiscent of John Calvin's ideal of clarity and brevity. He had a highly refined ability to expound the truth to the mind in such a way that it arouses a distinctly religious response. In so doing he exemplifies the principle that all biblical theology ultimately leads to doxology. B. 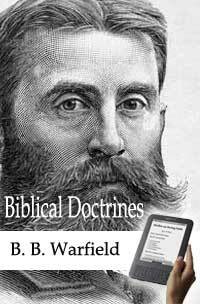 B. Warfield’s articulation of doctrine blurs the boundary between theology and biblical interpretation. He wrote so prolifically on both theology and the Bible that delineating where one ends and the other begins can be a challenging task. Warfield shows how all of these central doctrines are firmly rooted in Scripture. This volume also concludes with a complete appendix of Warfield’s articles on biblical doctrines. Please note: This book is not an introductory book and and in some places is fairly high on the scale of difficulty. Not for beginners.